1. Zealandia meets all the established criteria to be considered a continent. Accuracy and precision are everything in science. If we don’t adhere to scientific definitions by the book, then nothing in science will be credible. Land that pokes up relatively high from the ocean floor. A diversity of three types of rocks: igneous (spewed by volcanoes), metamorphic (altered by heat/pressure), and sedimentary (made by erosion). A thicker, less dense section of crust compared with surrounding ocean floor. Well-defined limits around a large enough area to be considered a continent rather than a microcontinent or continental fragment. The geologists determined that Zealandia meets all four of the criteria above. This conclusion was further supported by recent detailed satellite-based elevation and gravity maps of the ancient seafloor to show that Zealandia is indeed part of a unified region. The data also suggests Zealandia spans "approximately the area of greater India" — larger than Madagascar, New Guinea, Greenland, or other pieces of crust. Zealandia measures 1.9 million square miles, which is about two thirds of neighbouring Australia. Scientifically, it is an extremely important discovery and although there may not be a great impact on the world if Zealandia is labeled a continent, scientifically speaking it is correct, and therefore should be designated as one. 2. Making Zealandia a continent would economically benefit New Zealand and New Caledonia. Acknowledging the continental shelf of Zealandia gives New Zealand control over more of its ocean for drilling and mining rights. Having New Zealand control this underwater economic activity is better overall than leaving it open to any country for exploitation. When the Convention on the Law of the Sea held by the United National took place in the 1990s, 60 countries entered into an agreement that countries will own the oceans 12 miles from their shores. Between 12 and 200 miles, other countries can pass through without permission, but the nearest country still retains many drilling and fishing rights. Beyond 200 miles, there is no laws governing economic or other exploitative activities. However, one exception to that rule is Article 76, which says that a nation can lay claim to a continental shelf’s drilling and mining rights if they can prove it’s connected to their country. New Zealand started conducting scientific research into it’s surrounding waters and proved that there was continental crust, and the UN accepted New Zealand’s continental shelf in 2004. This significantly expanded New Zealand’s resource extractions rights. If the United Nations accepted Zealandia’s continental definition back in 2004, why can’t the rest of the world? The impact of this is that New Zealand's economy would benefit greatly from the nautical miles it has gained and the access to oil and other resources. It also means New Zealand will be responsible for protecting the ecosystem of this area. Officially recognizing Zealandia will mean consistent treatment in the future for this land mass, regardless of designations by the United Nations or any other international organization. 3. Scientists should designate Zealandia as our smallest continent, and in doing so, they should further define what size makes a land mass a continent. Zealandia should be our smallest continent, and scientists should make more definite size requirements to clear up how big a land mass must be to be called a “continent.” This should prevent future confusion about the definition of what makes a land mass a continent. “Designated” means accepted to be true by almost all scientists around the world, and as reflected in textbooks and other official publications. 1. There is no clear definition of what makes a continent, and Zealandia is different enough from the other continents that it clearly doesn’t belong. Zealandia is physically very different from other continents. These differences would make it a very odd partner with the other 7 continents. Zealandia is 94% underwater, drastically different than the other 7 continents. Also, it is only 3/5 the size of the smallest continent, Australia, if you include the underwater portion. If you include just the above water portion, it is only 4% of Australia, our smallest continent. 4%! If you compare the above water land portion of Zealandia with that of our largest continent, Asia, Zealandia is .6% of Asia’s size. Not even a full 1%! How can that make any sense to group them together? Also, only 6% of Zealandia is above water and the other continents are 80% or more above water. Another difference is that Zealandia doesn't have its own continental plate, unlike other continents. So what is Zealandia? Geologist Elizabeth Dowding of the University of New South Wales, says geologists do not define continents: instead, they characterize the types of crust and delineate their geological features. By this definition, Zealandia is not a continent. 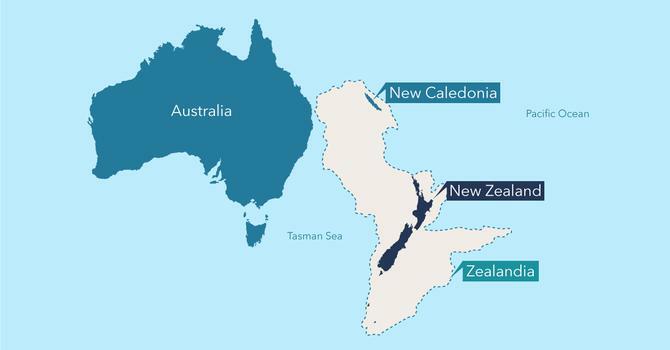 Indeed, it is 94% continental margin with an extended shelf.” Richard Ernst, a geologist at Carleton University in Ottawa, agrees that Zealandia is not a continent and proposes coining a new term — mini-continent— for Zealandia. He thinks this is perfect given that it is too large to be called a microcontinent and too small to be classified as a full-sized continent. Indeed, even the geologists from New Zealand who are lobbying to call Zealandia a continent acknowledge the sticky issue of Zealandia’s puny size compared to the other continents. They know Zealandia is too small, so they also want to impose a minimum size limitation of a million square kilometers on any future continents. Of course, they want this measurement to include underwater land as well, since Zealandia is 94% underwater. They want this arbitrary land size minimum because Zealandia would just make the cut but this would prevent other land masses that also could be called continents from getting the designation. How ridiculous and self-serving to close the door on other qualified land masses, such as Greenland, who also meet the same requirements as Zealandia, and which actually have more above water land mass like other continents. This is clearly self-serving and arbitrary, with no scientific logic. It may be easier to just throw Zealandia into an already existing category and slap on the continent or micro-continent label, but in fact, if we care about scientific accuracy, it is neither of these. It is a mini-continent, between a micro continent and a full continent. Intuitively, judge, given how different Zealandia is from our established continents, we know this makes more sense. 2. Land masses such as Greenland and surrounding areas also share the same characteristics of Zealandia, so if we accept Zealandia as a continent, they would have to be designated as continents too. We must be consistent in our application of scientific labels for the sake of scientific accuracy and progress. Greenland and surrounding areas has long been thought about as a continent, yet scientists have not made it one. Not only does it fall under the criteria for a continent, but it also has a much larger above water land area than Zealandia. And if the geological argument has to be considered impartially then an island like Madagascar should also get a status of a continent, and Europe and Asia would become the same continent, called Eurasia. In addition, CNN has just reported this month that deep at the bottom of the Indian Ocean, a research team, led by South Africa's University of the Witwatersrand, has found pieces of a continent dubbed 'Mauritia,' located under the popular island of Mauritius. The more we study submerged land mass with satellite imagery, the more likely we will find many other landmasses to call continents. Judge, if we accept Zealandia as a continent, many other new continents will follow, causing scientific and political disruption and confusion. These destabilizing events could cause tensions between various countries that could potentially lead to conflicts and wars over landmass, drilling rights, mining rights, etc. 3. Since there is no agreed upon scientific definition of continent, convention and tradition need to be acknowledged. There are other factors that have determined what we call continents, and even that is disputed today in different countries. We have never had a universally accepted designation of continents, and it hasn’t made any difference in world politics or economics or security. In the U.S., by convention, there are seven continents: Asia, Africa, North America, South America, Europe, Australia, and Antarctica. In other parts of the world, some geographers list only six continents, combining Europe and Asia into Eurasia. In parts of the world, students learn that there are just five continents: Eurasia, Australia, Africa, Antarctica, and the Americas, combining North and South America into one because if it wasn’t for the Panama Canal, a manmade structure, then North and South America would be one contiguous land mass. To some geographers, however, "continent" is not just a physical term; it also carries cultural connotations. For example, Europe and Asia are physically part of the same landmass, but the two areas are culturally diverse. (That is, the various cultural groups in Asia have more in common with one another than with those of Europe.) Islands located near a continent are generally considered, in a geographical sense, part of that continent. Greenland, for example, is politically part of Europe but belongs geographically to North America, as do the islands of the Caribbean and the western North Atlantic Ocean. There are some islands and island groups, however, that are not considered part of any continent, geographically speaking. Traditionally, New Zealand, Hawaii, and French Polynesia are among them. Oceania is the collective name for the lands of the Pacific Ocean, including Melanesia, Micronesia, and Polynesia. Oceania is a convenient way to name these areas, which, with the exception of Australia, are not part of any continent. But Oceania itself is not a continent. Judge, this hodgepodge of definitions is what has been in existence for hundreds of years with no meaningful consequences. A single study and the opinions of a few geologists should not be enough to change the way people think about continents.